AGC-FAL : It is designed with fully aluminum body. 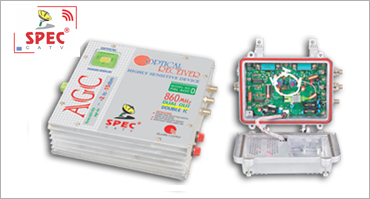 It has SUNLAND AGC module which is very accurate in performance & sensitive with optical conversion. Very professional design is used is used for RF amplification. Specific modules can be used according to user’s requirement. AGC-OUTDOOR: fully die-cast waterproof body is used for this AGC node. It has plug-in equalizer and splitter circuit. High voltage protection circuit (G.D.Tube) and power indicator circuit in I/P and O/P port is also incorporated.